Women in India do not hug, according to Pushpika Frietas. So she was surprised when Manisha Pawar, one of the MarketPlace artisans, was hugging everyone goodbye by the end of her second day in the US. “She wasn’t just hugging people, she was taking the initiative,” said Pushpika. “I asked her about it and she just said that it’s what everyone does here so she’s decided to do it too!” Bringing back to Mumbai those small but significant cultural understandings is one of the primary reasons Manisha was here. You can try to explain a way of life, or the depth of interest in the artisans felt by customers here, “but when it’s peer-to-peer, it’s more powerful,” emphasized Pushpika. 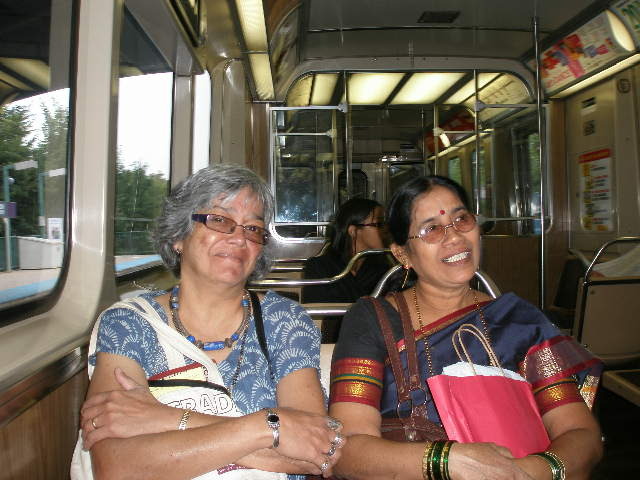 After two weeks in the US, Manisha Pawar and Shaily Agrawal have returned to India, full of stories and memories of enthusiastic hellos and affectionate goodbyes. The artisans visit was all that Pushpika hoped it would be, and more. MarketPlace has always placed a premium on the relationships between the women who make our pieces and the women who wear them. Several programs over the years have fostered long-distance exchanges. But only once before has MarketPlace found sponsors to help pay for the flights. The plan is to keep the artisans coming, whenever the money can be raised. Perhaps next time they can visit other cities where there are large numbers of MarketPlace customers. “Every time you bring someone here, the power of the messages they bring back home compounds,” Pushpika added. A second motive for organizing the visit was the transformative nature of being the recipient of other people’s time and money – of being valued. The women artisans, their families, and their entire community felt honored that MarketPlace would invest in Manisha and Shaily’s visit. A local political leader, who heard of the pending trip, told Manisha that she should give a talk about her travels to the general public upon her return, describing her as an example to all that if you work hard, dreams can come true. In a community of sometimes overwhelming poverty, this simple message isn’t often heard. Hearing it once can change a life, especially the life of a child. Manisha and Shaily both commented frequently on their surprise that hundreds of people came to see them and wanted to talk with them. They were acutely aware that they were speaking to people who were taking time away from busy lives to meet them. Both women commented on how they are respected here for their life and professional experience. This was most noticeable to the artisans at the talks they gave. At the Evanston YWCA, the audience came to hear Manisha’s thoughts on domestic violence. (Manisha has been a leader in the production of street plays about domestic violence, plays produced and performed by MarketPlace artisans.) On another day, members of Chicago Fair Trade came from around Chicagoland to ask Manisha and Shaily — who has a bird’s eye view of operations working out of the Mumbai central office — questions about quality control, production, and how they implement the MarketPlace business model so successfully. Although the trip itself is over, the story of this visit has just begun. Keep an eye on this blog for more news on the impact of Manisha and Shaily’s trip back home as they begin to share their experiences.